Three Billboards Outside Ebbing, Missouri is another masterpiece, director Martin McDonagh has given us. The Oscar-nominated film is undoubtedly a tough competition to The Shape of Water and The Post. It is a tragic-drama that unfolds to come out as a shocker to the audience. 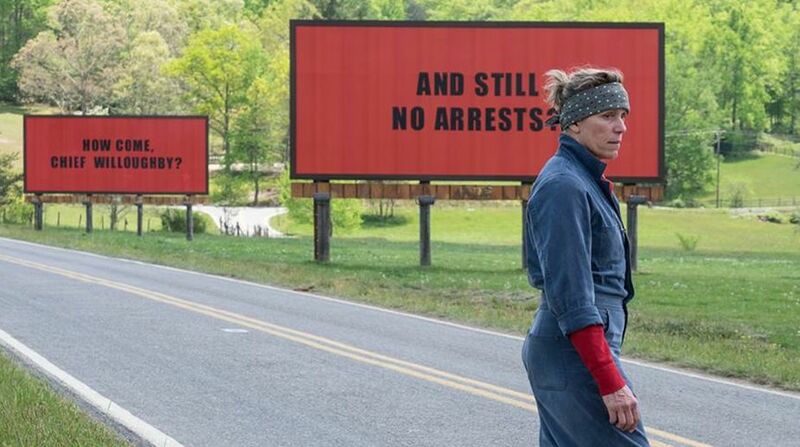 Three billboards explore the dark side of humour amid a tragedy and leave you in a dilemma whether to smile at the moment or get caught up in the drama. The story begins in a fictional small rural town, Ebbing in Missouri. Mildred Hayes, a mother of two, dealing with the death of her 19-year-old daughter, the character played by Frances McDormand, has delivered a brilliant performance in the grief-stricken story of a mother. Hayes rages a direct war against the administration by questioning their progress in the case. Mildred is the strongest character in the heart-wrenching drama and her craft will make it difficult for you to judge the character. The billboards do their job but it goes all wrong as Willougby (Woody Harrelson) urges Mrs. Hayes to take down the boards. The billboards trigger the wrong person – a racist, homophobic officer Dixon (Sam Rockwell), who later creates miserable situations for Mildred. Dixon is constantly schooled by his old mother on how to go about with the stuff and it’s terrible. What will keep you hooked to the screen is the unpredictability of the story, all the character have a grey shade and probably make it impossible to choose the hero and villain in the film. Peter Dinklage, is the little surprise in the film, who plays a midget trying you date Mildred. Mrs. Hayes doesn’t only fight against the administration but the media, the church, her divorced husband and even his son to get justice. The complexity of the story and the characters is what makes it remarkable. Eventually, an appalling incident (we better not reveal that) brings Hayes and Dixon together as a team. The second half of the story is a hunt for the culprit of Angela’s death. Three Billboards has a bitter-sweet ending, it places the viewer in a position where you just cannot decide whether to like how it ends or hate it. An abrupt closing of the story is what you couldn’t have predicted and it still isn’t disappointing. Lastly, it is a must watch film that will stay with you after it ends and arouse conflicting thoughts about the society. Did Game of Thrones star Peter Dinklage reveal a secret about mega series?